The following is an explanation of the theory behind "Omamori" in Japan. In Japan the lucky charms called "Omamori," (literally "protectors") are said to work by being a decoy-self ("migawari) that attracts bad luck. Omamori are basically very similar to the larger tablets bearing the name of the deity "ofuda" that one receives from a Shinto shrine. These larger tablets are enshrined within the home on the Spirit Shelf (Kamidana). 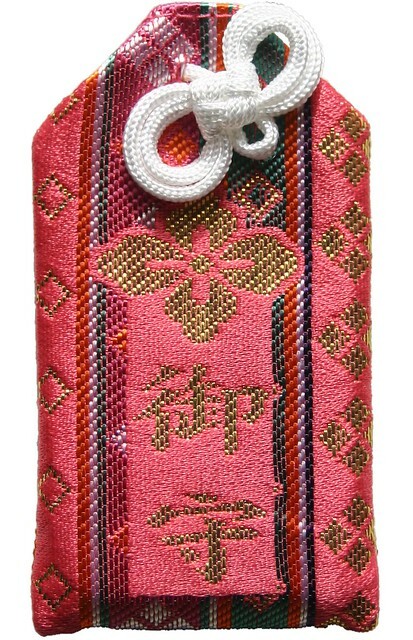 Omamori are also basically pieces of paper stamped with the name of the god. The easiest way to answer this question is by referring to Japanese Buddhism. Japanese Buddhism concentrates on rituals for the dead. The dead are enshrined in the household inside the "butsudan" or buddha cupboard. Inside the buddha cupboard there is an effigy of the buddha, but perhaps more importantly there are a lot of little tablets (called ihai) which represent one's dead relatives. People open the butsudan and say "hello grandpa" to their grandfather in the form of his little tablet. According to the Japanese ethnologist Yanagita Kunio, the Budda cupboard (Butsudan) and the Spirit Shelf (Kamidana). The spirit shelf was for the living and the bustudan was for the dead but basically in both there was a deity (Shinto Kami or spirit, or Buddhist buddha) and in both there was representations of members of the household, living or dead. Today in Japan there are few personal tablets for the living (other than omamori) but there are traditions of sticking the names of the living onto the shrine shelf in some parts of Japan. In the past, people recieved a part of the spirit of their local shrine and this in a sense gave them life. In other words a ticket or tag from the shrine represented a person. This is why a "omamori" is a bit like a spare ID card. If you have some bad luck, like being caught doing a minor misdemeanour then you charge it, or put it down to the spare id, which you throw away at the end of the year.